Mathieu Garon allowed 3 goals on 22 shots for the loss including his obligatory 1 that he'd want back. The Lightning outshot Buffalo 33-22 with most of that coming once they spotted the Sabres the 3 goal lead. I have no idea what sort of weird sports psychology issue makes a team only start playing harder once they fall behind big. It's bizarre. That's something for Jon Cooper to sort out in the offseason. In the meantime, the Lightning will be looking at one of the big three draft prospects or possibly Traktor Chelyabinsk power forward Valery Nichushkin in their future. Alex Killorn had 3 shots in 20:26. Richard Panik was -2 with 2 shots and 1 hit. The biggest challenge for a young player isn't proving you can be brilliant as Panik was last night. The biggest challenge is proving you can do it consistently, and Panik was a non-factor tonight. Radko Gudas was -1 with 5 hits and 2 blocked shots in 17:40. After beating Elmira twice in its own barn to push the Jackals to the brink of elimination, Florida came up well short in its first shot at clinching a series victory, falling 4-0 before mustering its first and only goal past the midpoint of the third period. The Everblades managed 28 shots in the game but had difficulty generating offense until the game was well out of reach, as only 11 of those came through the first two frames. Both clubs ended the match 1-for-5 with the man advantage. Jesse Deckert stopped 24 of 28 Jackals shots. Both clubs will next head back to Estero for the remainder of the series, with Game 6 to be played Monday night. The magical ride of Quinnipiac and Matt Peca was going to end anyway on Saturday, but they would have preferred it end with a win. The top-ranked Bobcats, playing in their first national tournament, were beaten by upstart Yale, 4-0. It was the fourth time the two state and ECAC rivals met this year and the first time Yale won. It just happened to be for the national championship. There is a chance the Lightning starts Peca on the road to the NHL by signing him and placing him in AHL Syracuse next year, but that doesn’t seem like the normally patient approach by Bolts GM Steve Yzerman. If Peca returns for his junior year he will be one of the early Hobey Baker candidates. In his first game since being sent down, Brett Connolly made an immediate impact. 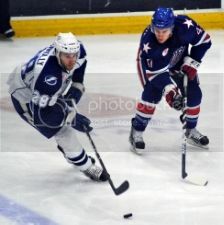 Reassigned by the Tampa Bay Lightning Friday, Connolly scored three times to lead the Syracuse Crunch to a 5-1 win over the Rochester Americans at the Onondaga County War Memorial Saturday. "I didn't expect to get three, but I wanted to help out and help the team win," he said. "I was fortunate enough to get a couple good looks and they went in for me." With the victory, Syracuse remains two points ahead of Binghamton in the East Division, and clinches home ice advantage in the first round of the postseason.